Hidden Valley Hibiscus - Hibiscus History . Where did these beautiful flowers come from? The ancestors of today's modern hibiscus hybrids were sprinkled all around the globe, following the Equator from one warm, tropical land to the next. 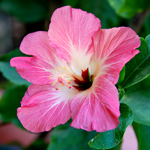 The eight hibiscus species that are considered to be the ancestors of the modern exotic hibiscus were originally native to Mauritius, Madagascar, Fiji, Hawaii, and either China or India. What were the ancestors like? Similar in many ways to today's hibiscus, the ancestors were characterized by free flowering, tall and willowy bushes (mostly), and the ability to form seeds using their own pollen that would grow into plants that are genetically identical to the parent plants. The flowers were smaller than many of today's hibiscus, but they made an abundance of these smaller, single-colored blooms. Why are these hibiscus species considered ancestral to the modern varieties and not others of the hundreds of known hibiscus species? These eight hibiscus species have all been involved in the development of the modern hybrids that we are familiar with today. That means that they have proven to be cross-compatible with at least one other of these ancestral species. In other words, applying the pollen of one of these species to the staminal pads of another of these species will result in seeds that are viable. Most hibiscus species are not genetically compatible with each other and cannot reproduce with each other, but these eight can do so and have been so used over the last 300 years. Do the ancestors still exist, and can we find them to grow? Hibiscus rosa-sinensis: This one is a little confusing because you will often see the entire group of ornamental, tropical hibiscus that are so common in the southern US referred to as named varieties of Hibiscus rosa-sinensis. This is not entirely accurate, as ornamental hibiscus are really all hybrid crosses of any of these eight original native species hibiscus. So even though modern hibiscus are all called varieties of Hibiscus rosa-sinensis, the truth is that they're all a mix of several species. 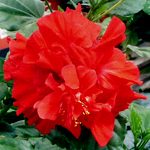 But Hibiscus rosa-sinensis is actually the correct name of one of the original species plants. Hibiscus rosa-sinensis was first discovered in China or perhaps India. Botanists are not really certain, since no wild stands of Hibiscus rosa-sinensis have been found growing anywhere. Wherever it originated, it was brought back to Europe by explorers in the 1700s. Carl Linnaeus, who gave us the Latin based taxonomy of plants that became the standard, collected at least one specimen of Hibiscus rosa-sinensis and gave it that name in 1753 when he released his famous books, "Species Plantarum" (Species of Plants). He described a red double flower in that first naming of hibiscus. This species, Hibiscus rosa-sinensis, has been grown ever since in European botanical gardens and by private collectors. HVH obtained it from Europe a few years ago and now offers it in our online store. It is a beautiful, vigorous, glossy-leafed plant with intensely bright red, double flowers. It is very fun and easy to grow, even as a houseplant, and it is definitely recommended for modern hibiscus lovers. Hibiscus lilliflorus: This species of hibiscus is native to the Mascarene Islands off the east coast of Africa. One of these islands, Mauritius, has been an important seaport for centuries. Back in the 1700s and 1800s it was a major stopping point for ships sailing around the southern tip of Africa on their way to or from India and China. 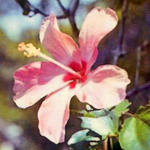 Mauritius was controlled by several European countries at different times in its history, but during the English rule in the 1800s, it was discovered that Hibiscus lilliflorus, native to Mauritius, could be cross-pollinated with Hibiscus rosa-sinensis and new, fertile hybrids would result. Hibiscus lilliflorus still exists in Mauritius and is grown in many botanical gardens around the world. HVH collected this species from the Quail Botanical Gardens in Encinitas, California, and now offers Hibiscus lilliflorus plants in our Online Store. It is a tall, slender plant, and a vigorous grower. The flowers are 3-4" flute-shaped singles that are produced freely and in abundance. Easy to grow, we highly recommend this ancestral species for anyone interested in hibiscus. Hibiscus schizopetalus: This species was discovered on Madagascar, a large island located between Mauritius and the east coast of Africa. Since its discovery, the unique flowers have caused this species to become highly desired by plant collectors, and it is now found in private and public gardens around the world. Schizopetalus means "split petals" and describes the unique and delicate look of the flowers of this hibiscus. 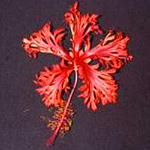 Hibiscus schizopetalus is spread mostly by vegetative propagation, and HVH now offers plants of it from our online store. It grows tall and lanky with medium vigor, and the charming flowers appear on every stem once it matures. The most unusual of all the hibiscus species, Hibiscus schizopetalus is a worthy addition to any hibiscus collection. Hibiscus fragilis: This species was also discovered on the island of Mauritius, but is almost extinct in the wild. Only a few dozen plants of it are known to still be growing on the island, but botanical gardens such as the Kew Gardens in England have made efforts to save it from extinction. HVH has obtained seeds of Hibiscus fragilis and plans to offer this rare species starting in 2010. The flowers are red singles, and the bush seems so far to be slow growing and sturdy. We will have more to say about this endangered species as our own plants of it grow and mature. Hibiscus genevieve: This is the third species of hibiscus to be discovered on Mauritius. It is said to have pink single flowers, but we have so far been unable to obtain seeds of a plant of this species. If we do we will have more to say about it. Hibiscus arnottianus: This species was discovered all the way around the world from Africa, growing on the Hawaiian Islands. 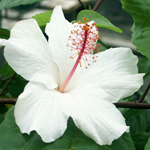 The flowers are white, and the bush is well branched though less tall and upright than the African hibiscus species. Once Hibiscus arnottianus was spread among the various islands, the species formed various sub-species as they evolved on the separate islands. These sub-species, though very similar, vary slightly one from the other. Today it is rather difficult to determine if one has a particular sub-species, so many are collected, traded or sold as Hibiscus arnottianus without making the distinction. 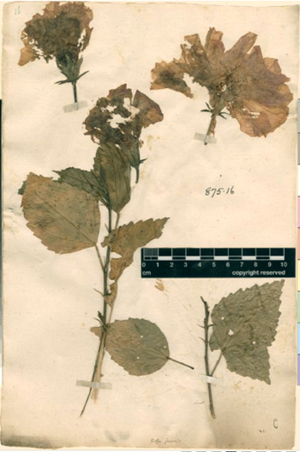 HVH collected two forms of Hibiscus arnottianus. One was far more fragrant than the other and this is the one we still have. We will be offering more of the fragrant variant in future years, but for now they remain very rare. Hibiscus storckii: This species was discovered and named by a botanist visiting the island of Fiji back in the 1800s. Expeditions to the island since then have not located any surviving examples of this species of hibiscus still growing on Fiji. The flowers are light pink, and the bush is said to be small with cascading branches. Kew Botanical Gardens in England received cuttings of this species directly from the botanist who discovered it and fortunately has been able to grow it continually ever since. HVH was fortunate to obtain seeds of Hibiscus storckii last year. We are now growing a number of plants of this species, and when we have enough to offer through the Online Store we will make it available. Hibiscus kokio: This species is another that was discovered growing in the Hawaiian Islands. 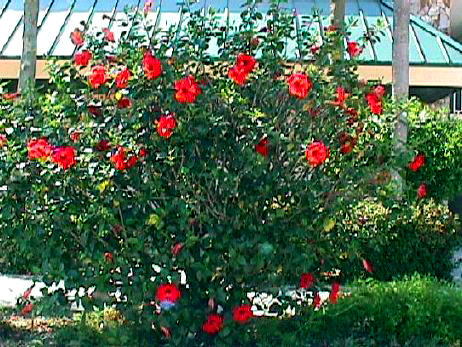 It is a smaller, less vigorous hibiscus, making small red flowers. 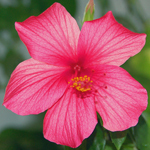 We doubt that this species has played much of a role in the development of the modern ornamental hibiscus, but are still researching this question. HVH is growing a single plant of Hibiscus kokio but has not had much success in propagating it so far. If that situation changes we will offer Hibiscus kokio through the Online Store. Why should I bother collecting and growing the ancestral species? Several reasons, in our opinion. First, they are great plants that bloom more freely than most of the modern exotic varieties. Second, it is fascinating to possess and grow historically important plants. Once you do, you can see where various traits in modern varieties likely came from. You can also use the ancestors as part of a hybridizing program to infuse vigor and ease of propagation back into a line of modern varieties. And lastly, by growing these original species plants, you are helping to keep them safe from extinction. None have secure native environments to thrive in, and some are extinct except for the specimens grown in human planted gardens. These eight species of hibiscus found all around the world are genetically related enough to be able to successfully cross-pollinate each other. In other words, any of these eight species can serve as mother or father (seed maker or pollen donor) and viable seeds that will germinate and grow as hybrids will result from this cross-pollination. Take a look at at the world map above - isn't it fascinating that these eight genetically related species were originally found so widely separated around the world? Where did the hybridizing begin? We don't know how the original 8 species of hibiscus came to be separated from each other. We can speculate that at one time they grew closer together but that continental drift eventually separated them. 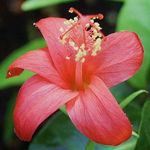 Or, it is possible that they all come from the same ancestral hibiscus and that this ancestral plant evolved into the different but related species once stands of this ancestral species were separated from each other. We can see this happening even now in the Hawaiian islands when plants of one of the Hawaiian native hibiscus species develop unique characteristics as they grow and evolve on separate islands. Another theory worthy of consideration is that in pre-historic times the ancestors of the Polynesian people set out from their original home in southeast Asia and migrated throughout the Pacific, carrying with them seeds of the original hibiscus species that they planted in various locations during this long migration. However it happened, by the year 1700, eight cross-compatible hibiscus species were growing naturally on tropical islands off the east coast of Africa and all the way to Hawaii. Take another look at the map. The island location of the original species played a critical role in what happened next. By the 1700's, when Carl Linnaeus named one of the species Hibiscus rosa-sinensis, European exploration of the world by ship was well underway. Many ships sailed with botanists and zoologists, whose job it was to discover new and commercially important species of plants and animals. Many ships were engaged in trade with the Far East, and the most common route between Europe and China was around the southern tip of Africa. As the map shows, the islands of Mauritius and Madagascar lie along this trade route. Both islands were used as important ports where ships would stop to resupply for the journey ahead. Between 1700 and 1900, Mauritius was a key island involved in spreading hibiscus around the world. Many ships called in the port on their way to and from the ports of India, China, and Europe. 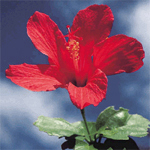 Mauritius itself was the natural location of 3 of the 8 cross-compatible species of hibiscus. In addition, an Irish surgeon and naturalist, Charles Telfair, settled on Mauritius with his wife Annabella in 1810 when the British occupied Mauritius. Telfair hybridized hibiscus for the next 20 years and kept a written record of his efforts. We don't know how many of these early hybrids made their way onto ships and thus around the world, but it is likely that many of them did. 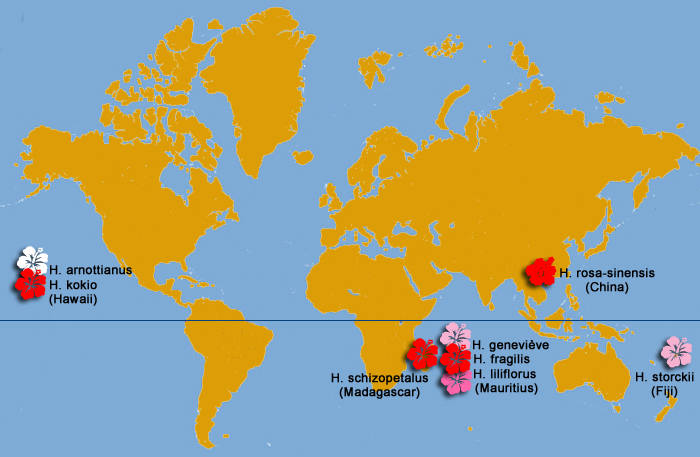 There is no complete or even detailed documentation existing today that allows us to trace the early hybrids of hibiscus made on Mauritius or any of the other places where the species hibiscus were found. It is likely that Kew Gardens in England and other horticultural centers in Europe also created hybrids using these species hibiscus. What we do know is that by the early 1900's a number of hibiscus hybrids were being used extensively in landscaping throughout the world. The common red single flowered hibiscus, called Brilliant in the USA, is probably the best known hibiscus in the world. Nobody knows where it came from or when it was hybridized. It seems likely that the single red species on Mauritius, known as Hibiscus fragilis, was either a parent or an ancestor of Brilliant. Also well known by the 1900's was the pink single known as Pink Versicolor, with similarities to the species H. liliiflorus. An example of a hybrid that came from early European hybridizing is Cooperii, with its unusual variegated leaves. 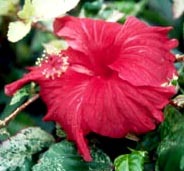 By 1900, first and second generation hybrids of hibiscus were growing in most tropical and sub-tropical areas of the world. Although many improved on the species plants in one way or another, they had not yet attained the flower size and vast array of colors that were to come from more intense hybridization in the 20th Century. This was first done in Hawaii in the first decade of the new century. 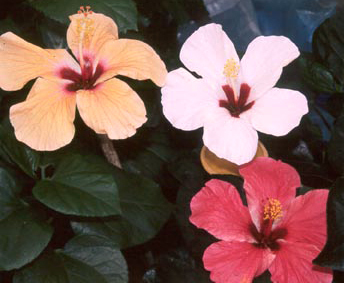 Our next installment of this article will take a look at the hybridization that resulted in the gorgeous, modern hibiscus hybrids that are available today.